Providing children with access to the Internet at school can help boost their education as well as support the work of teachers in the classroom. The Internet can be an amazing resource for students. Web sites around the world offer incredible educational resources, as well as information on news and current events, plus discussion opportunities and the chance to communicate with fellow students across the globe. 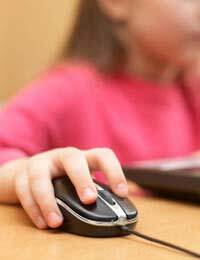 The Internet can also, however, contain some dangerous, unpleasant and undesirable sites which children should not access. You may want to find out if the school has an Internet access policy, including a "firewall" filtering system which works by preventing access to material on certain websites. Most schools put together an Internet access policy describing the rules and regulations about using the net at school. Many schools send these policies out to parents so that they can be aware of the computer policies in place at school. If you do have a copy, some of the things you might want to consider looking for in the text include whether children are allowed to use the Internet during lesson time and whether any Internet sessions are under supervision by the class teacher. Another idea might be to see whether the school posts its Internet usage rules up on the wall near computer systems so children are aware of them. It is also a good idea to look into what might happen if a pupil discovered offensive or upsetting material on the Internet. How would the firewall be developed, would support be available for the child? Look into whether the Internet is used effectively to boost the learning experience for children - are they taught at school how to search the web to find information? Are they taught about using e-mail effectively? These issues should all be outlined in the Internet access policy. This letter format laid out below shows how parents can write to a school to request information about the school Internet access policy. It is based on a fictional family's contact with their school. My son Rob, in year 7 at The School House, has started to use the Internet to help with home work and to have fun. This is a positive step but there are obviously safety implications too and I wanted to enquire about the school's Internet safety policy. Is Internet usage supervised? Are students taught how to use the net responsibly and efficiently? Are there readily available guidelines for students? I look forward to hearing from you about this. If you have a hard copy available of the school Internet usage policy I would appreciate the opportunity to read through the document. You can contact me, Mother, on 0131 2343 9049 or 0723422342, or email me at mother@parents.com, or via the address above.